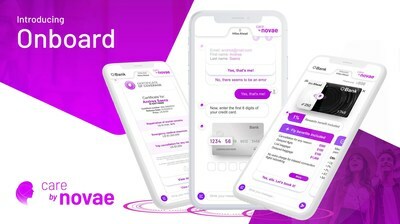 SAN FRANCISCO, March 12,Â 2019 /PRNewswire/ --Â The fintech and insurtech companyÂ novaeÂ has launchedÂ Onboard,Â an all-digital platform that allows bank cardholders to access all their card-related benefitsÂ byÂ simply downloading the app and entering the first six digits of their cards. OnboardÂ allows clients to visualize not only their bank card benefits, but also to instantly activate and access a comprehensive suite of travel-related benefits that include medical emergencies, baggage loss or delay and other bank benefits â�“ all enabled automatically once they download and activate through the app. After the card is activated throughÂ Onboard'sÂ seamless digital journey, bank clients can enjoy their card-related benefits through a few quick and simple steps on their device at any time, wherever they are. For a small annual fee,Â OnboardÂ users can choose to access an expanded travel-related benefits membership offering up to 5% in rewards when booking travel and up to 35% in discounts on unparalleled travel content. The membership features unbeatable fare conditions, best-price guarantees and no rebooking or cancellation fees. When booking flights, members accessÂ FlyCare,Â which includes protections against trip cancellation for any reason and lost or delayed baggage for all flight bookings. When booking hotels, they accessÂ StayCare,Â featuring enhanced coverage for emergency medical expenses as well as compensation in the event of trip interruptions for any reason. The benefits are included in the booking fare, with no additional costs or hidden fees. Claims submissions are all managed via easily-to-complete online forms, with instant compensation for travel-related inconveniences, such as baggage loss or delay. The launch ofÂ OnboardÂ took place atÂ Nexthon II, novae's semiannual event celebrating disruptive experiences, which gathered some of the brightest minds in the fintech and insurtech industry via livestream. Paola Duran, novae's Head of Global Product & Marketing Solutions, and Rosamaria Mussfeldt, Head of Disruptive Experiences, were some of the company executives who explained howÂ OnboardÂ converges the two pillars of the company's insurtech business, caring and connecting. Detailing the thinking behindÂ Onboard, Duran explained that, "consumers are frustrated by not being aware of the benefits available through their cards. Making card benefits automatic, easy and transparent is our ultimate value proposition, and an app was the perfect vehicle for delivering it to users on the road around the world." "The experience makes all the difference, and it always starts with a conversation," said Mussfeldt, referencing how alle automates predictive tasks and restricts live-person treatment for when it's really needed, yielding an unmatched user experience.